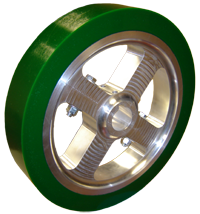 Redco™ 70A offers high compression resistance and withstands heavier loads while maintaining gripping characteristics. Redco™ 70A excels when bonded to steel as an impact pad or wheel cover. Packaging system parts, feed system parts, shock pads, springs, seals, shock and vibration pads, washers, etc.